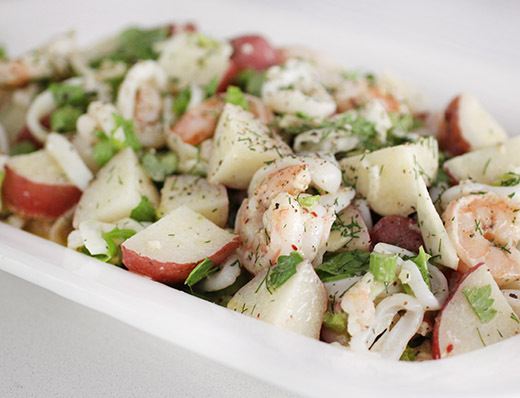 As soon as we have a hint of summery weather, seafood salad is on my mind. I really believe it’s an ideal meal when it’s hot outside. In fact, if I could spend every day of summer sitting poolside with a supply of such a salad in a nearby refrigerator, I’d be extremely happy. Sadly, there’s no pool in my backyard, but whipping up more seafood salad every few days is definitely doable. I had just read about a lovely-sounding version in Tartine All Day: Modern Recipes for the Home Cook , and the time was right. During this late spring-not-quite-summer yet season, the local farms have fennel, celery, onion, and new potatoes. And, all of those things happen to be perfect elements of a seafood salad. For the main attraction, the seafood, you can pick and choose whatever combination you prefer. This time, I kept it simple with just shrimp and squid, but chunks of halibut, some scallops, and clams would have been great mixed in as well. What I really liked was the preparation method of the recipe in the book. You begin my making a quick and easy court bouillon with water, bay leaves, thyme sprigs, sliced lemon, chopped shallot, a few peppercorns, and some salt. The seafood was cooked in batches in the simmering stock. By cooking the shrimp by itself before cooking the squid by itself, you have better control of the timing and can pull everything out of the stock with a slotted spoon at just the right moment. As the seafood drained and cooled a bit, new potatoes were then cooked in the same court bouillon. This was a great idea for adding flavor to the potatoes and for making the process efficient by only using one pot. After the potatoes were tender but not mushy, they were drained and allowed to cool. The dressing was a mixture of lemon juice, olive oil, minced garlic, chopped oregano, minced shallot, and salt and pepper. I wanted to give it just a bit of thickness, and so I added some mayonnaise. 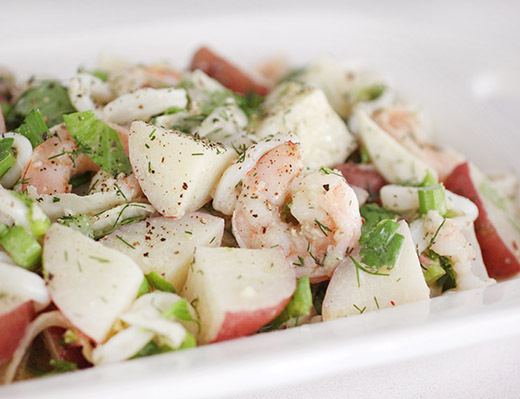 In the book, the salad is just those items: the seafood, potatoes, and dressing. I added thinly sliced raw fennel and chopped celery and served it with dressed arugula on the side. Two lessons I learned from this were: always cook some potatoes in a court bouillon after poaching seafood; and, when you have fresh, local celery, potatoes, and fennel, put them in a seafood salad. I just need to work on getting a pool into my backyard, and I’ll be set. Fresh, seasonal and lots of flavours! I would love some! A beautiful salad! So many fabulous flavours. Interesting idea to cook potatoes in your court bouillon! I'm going to try that :-) Love seafood salads, and you're right -- ideal at this time of the year. Thanks! What a perfect summer meal! 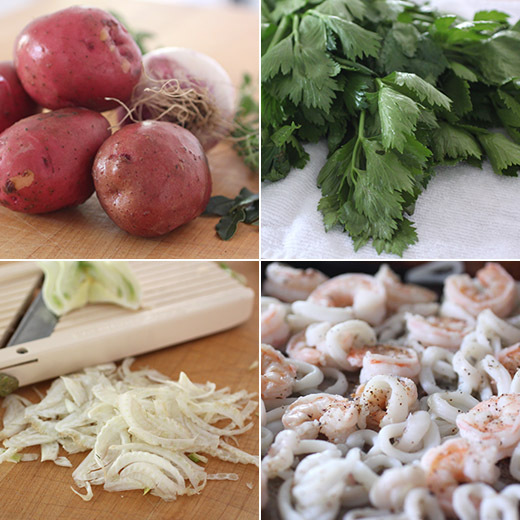 Cooking both the seafood and potatoes the delicious court bouillon is the perfect way to ensure a delectable salad. Love this combo of ingredients! Delightful and mouth-watering salad, perfect for the upcoming summer days! Oh Lisa, this seafood salad looks awesome, and yes,perfect for the summer days which are just around the corner. This is such a delightful salad recipe! Seafood is something I can eat every day!